For a horror movie that wants to be taken so seriously I found this resorted to an awful lot of lazy clichés, in both setting and characterisation. Once Marcia Gay Harden's religious nut job took centre stage I found my interest waning, since the film’s "statement", as such, was delivered with in bludgeoning, by-the-numbers splenetic form. 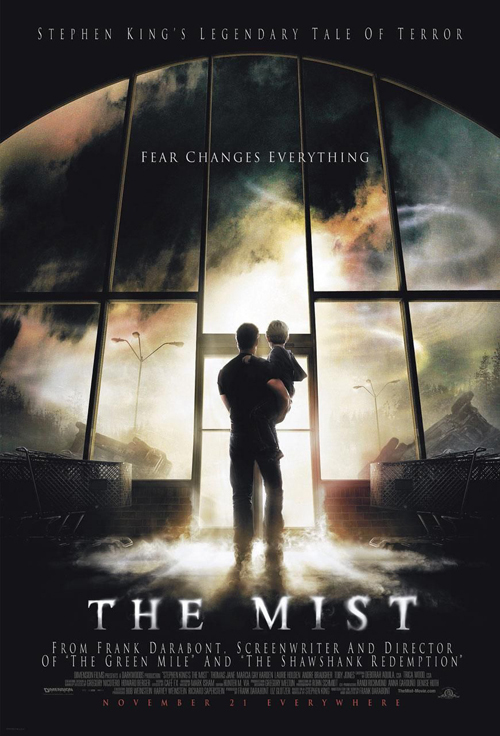 That said, Frank Darabont's direction is never less than sure-handed, Thomas Jane is very good, and there's a certain Cuthulu-esque eeriness to parts of it (although I kept thinking of Cloverfield, which at least had the sense to not let up the pace and draw attention to its deficiencies). As for the ending; nice idea, but it seemed gimmicky and unearned since the piece as a whole lacked the resonance or coherence to render it truly impactful. Also, what's with casting Andre Braugher then hardly using the guy?